Sorry Punxsutawney Phil and your six-more-weeks-of-winter prediction, but if you live in New England and are a fan of Red Sox, a sure sign of spring has arrived — Truck Day! 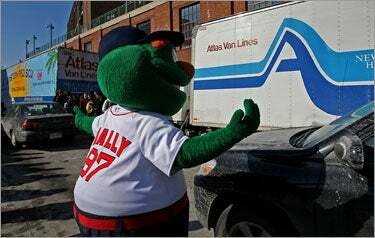 Red Sox fans joined the team’s mascot, Wally the Green Monster (pictured, right), as well as legend Johnny Pesky to bid a safe voyage to the moving truck that has transported the team’s spring training gear from Fenway Park to Fort Myers, Fla. since 1998. The truck (check out photos of it in this gallery) arrived at a chilly Fenway Park this morning just after 6 a.m. and the packing began at around 7:30 a.m. Fully loaded and ready for warmer temperatures, the truck departed from Fenway around 3:30 p.m. this afternoon. Truck driver Al Hartz of New England Household Moving and Storage, the company that has carted the Sox gear to Florida for the last 11 years, was back to drive the truck for the 11th time himself. Along with all of the Sox’ gear, a box of e-mails containing well-wishes from fans in Red Sox Nation were also loaded on the truck. They were intended to bring the Red Sox good luck for the 2009 season. Red Sox Hall of Famer Pesky served as the Grand Marshal of the truck departure this afternoon. Pesky, whose uniform number ‘6’ was formally retired by the Red Sox last year, ceremoniously “started” the engines of the equipment truck. Fans who stopped by to see the truck also had the chance to purchase newly released standing room tickets for Sox games throughout the summer of 2009. These tickets are only available tomorrow at the Fenway Park box office. Here’s a look back at last year’s Truck Day festivities, and here are our ’07 photos of the truck being loaded with bats, balls, and any other stuff the Sox need in Fort Myers (a motorcycle or two, perhaps?). And for those of you who really can’t get enough, we have photos of Truck Day ’06 as well.